Before stepping out into the great outdoors, a quality pair of hiking boots is critical. Low-quality boots will cause pain, lack of support, achy feet and can even make you a little wobbly due to the lack of stability. The right pair of hiking boots not only keeps your feet comfortable but it provides the support you desperately need. As you walk over uneven and rough terrain, your feet absorb a significant amount of shock. This can cause swelling and pain in your legs over time. And not only do your feet hurt, but other parts of your body such as your hips and knees can experience discomfort. Much of this pain can be prevented by finding proper hiking boots. However, as you begin your hunt for the right American-built hiking boot, you need to narrow down your search. 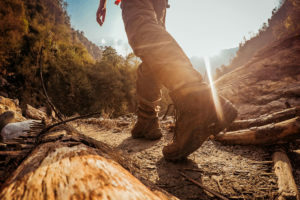 Hiking boots vary greatly and you need to know what you are looking for and need before you begin.